Dear Candidate, All the best. Be available on 21st Jan, 18 (Sunday), walk in interview in Mumbai for everyone. Add : Ramniranjan Jhunjhunwala College, Opposite Ghatkopar Railway Station, Ghatkopar West, Mumbai 400086, Maharashtra, INDIA. 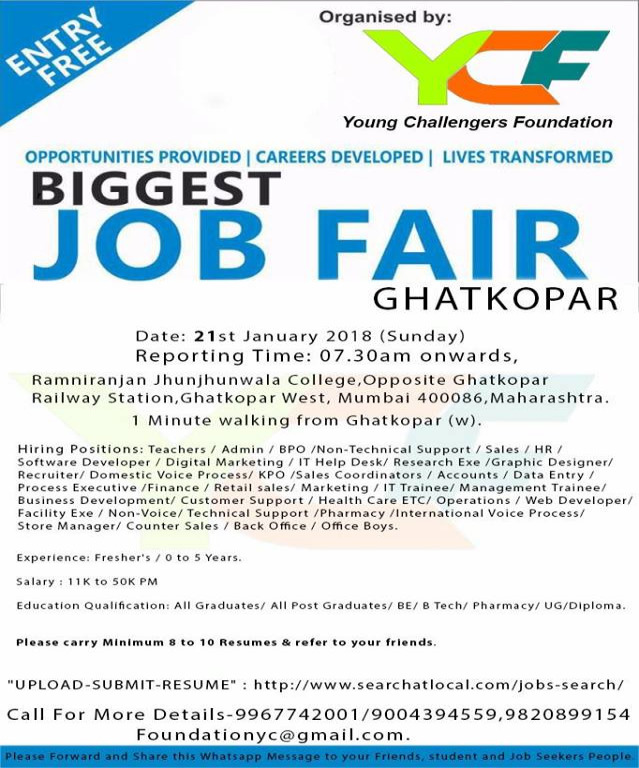 Abhishek Dhruv I am extremely interested in upcoming jobfairs of yours on 21st January at Ghatkopar, Mumbai. Can you mail me the link or list of companies participating in this job fair. I want to know the names of pharmacy related companies as well as the names of other companies in healthcare sector.